Cone-shaped, high top hat with its brim rolled on one side. 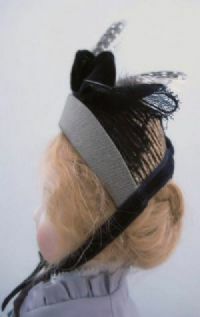 It is decorated with a narrow band of silk ribbon loops and feathers. 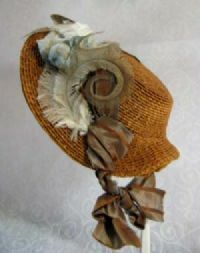 A very fashionable hat worn by ladies as well as young girls of the late 1800's. IIt fits the 12" Ultimate Fashion© dolls. 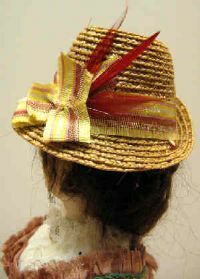 This extraordinary straw hat has wide front brim and sides which narrows into a smaller back brim. Rounded flat-top crown with a wide band. The extended front brim is a bit “square” on the outside edge. Soft cotton velveteen lines the inside brim of our hat. 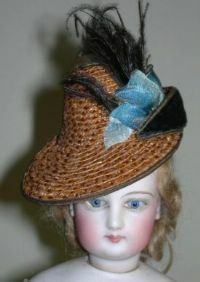 Suitable for dolls with an 11"-12" head circumference. 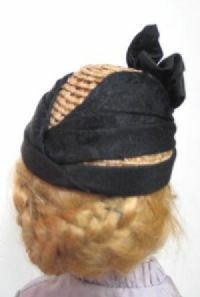 Requires approximately 24 yards of 1/4 inch hat braid sold separately or as part of a kit. 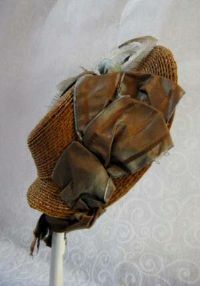 In the 1830's, during the reign of young Queen Victoria, wide brimmed bonnets were a must have accessory. 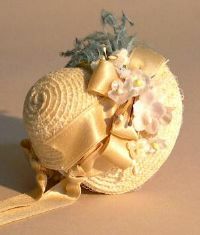 You can trim your bonnet using frills, feathers, flowers and ribbons which were traditionally changed with the seasons. 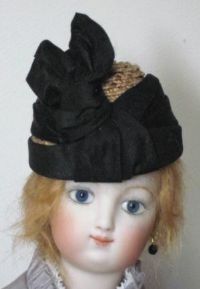 This adorable straw bonnet fits the 12" Ultimate Fashion © Doll or 12" French Fashion Doll. Step by step instructions with color pictures included with each form. Now available! 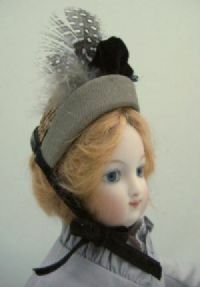 This straw bonnet was designed to fit the 12" Ultimate Fashion© dolls. 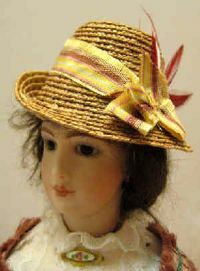 This jaunty hat, tilted to one side, will give your fashion doll a real sophisticated look.